Does the name Ugo Fantozzi sound familiar? And what about Geometra Filini? Or Contessa Serbelloni Mazzanti Vien dal Mare? Simply put, we are talking about some of the most influential Italian literature and TV in the post-war era. Which also happens to be absolutely hilarious. Curious? Because you should be. If you have an interest in the Italian contemporary culture, and if you want to know more, you really need to read this post. Ragionier Ugo Fantozzi. “Ragioniere” means “accountant”. Titles define people, in the world created by Villaggio. As in formal systems and bureaucracies. Ugo Fantozzi is the name of a television and film character, the protagonist of a series of best selling books (translated in several languages) and no less than 10 movies. His creator was Paolo Villaggio. A visionary, political thinker and great all-round artist: during his career Villaggio has been author, screenwriter, song writer, and a very prolific theater and cinema actor – shifting between drama, stand-up, situational comedy and slapstick. He worked with some of the biggest names in the Italian cinema, including Monicelli, Comencini and Fellini. Villaggio in one of his latest TV appearances. Never hiding his nature – or maybe never leaving his character – of the grumpy, vitriolic, cynical but fundamentally good natured man – he left a deep and personal mark in the political and cultural debate of his times. In his honor, people organize film screenings, trips, and even crazy sport events. I really think his name should be remembered among the greatest of all times, together with the likes of Ugo Tognazzi, Marcello Mastroianni, Vittorio Gassman and Alberto Sordi. Villaggio died last week: 3rd of July, 2017. Through his work he has been some kind of a father figure for me and many of my generation, and his passing (not completely unexpected: he was 84 and suffered of diabetes) left me deeply touched. In the past few days everybody, literally everybody in Italy, was writing something about him and his legacy. So, well… I decided to do exactly the same. This post is my emotional and very personal homage to him. Since there are not many sources in English (even the wikipedia page is quite essential), I will write about the relevance of his work to an international audience. The idea is that this will remain online as a resource, and hopefully some readers will find the material fresh and interesting. Thank you for reading it. Or at least, watch the pictures! Villaggio as “Professor Kranz”(1971), a sadistic stage magician who mistreated his audience (ph. gettyimages). In the early 70s Villaggio was already a stand-up comedian of some fame, appearing in theaters and TV. His most successful characters were Giandomenico Fracchia and Ugo Fantozzi – roughly two incarnations of the same idea: a modern archetype of the underpaid, humble, fearful and yet ambitious white-collar worker that inhabited every company and public office in Italy. Fracchia interrogated by Commissioner Auricchio (Lino Banfi) in “Fracchia la Belva Umana” (1981). Another cult masterpiece, crossover between a police movie and a slapstick Italian comedy of errors. Villaggio was playing two phisically identical characters: “La Belva”, a ferocious serial killer; and Fracchia, a meek accountant. Their interactions are an acting and writing master class. It is important to remember that these concepts were developed in the early 70s. Italy was just experiencing the final beats of its post war “economic miracle”, with the negative side effects starting to unfold: unemployment on the rise, social tensions, loss of cultural heritage and traditions being replaced by consumerism and hedonism. (Hey, of course it’s much more complex: a detailed social analysis of that transition would be way out of the original scope of this post. Feel free to include more details in the comments and I will take them onboard!). and two movies, which had commercial success, but not a great cultural impact. The character somehow mutated into Fantozzi, a more grotesque, angry and twisted version of the same concept, who appeared first in a series of short articles on L’Europeo that were collected in a novel and published in 1971. It became an instant best seller, with one and a half million copies sold (huge numbers for the Italian market), and the beginning of an era. The book was written in a unique style mixing comedy, drama and a surreal tone – critics noted influences from Gogol, Kafka, Dostoyevsky, Calvino. Soon after, Fantozzi became the protagonist of a movie (directed by Luciano Salce), which was a spectacular hit for the time: #1 in the Italian charts from April to Christmas in 1975, grossing 5 billion liras (Star Wars in ’77 made 9, by comparison). You can watch it completely on youtube (no subtitles, unfortunately, but you can find them here, for example). It was such a hit, two sequels were released almost immediately. Il Secondo Tragico Fantozzi (again directed by Salce) in 1976 – which is just a continuation of the first episode, and still probably the best movie of the whole series. and in 1980 Fantozzi contro Tutti (directed by Neri Parenti and Villaggio himself), which still contains some memorable gags, but somehow shows the signs that the corrosive, explosive original comedy force is starting to slow down. Have you watched the movies? If not, you really should! And then come back here. The saga counts 10 films all together (the last released in 1999), but the almost unanimous consensus is that the most valuable are the first two (maybe three, depending who you ask). You can watch them on youtube – and a big shout out to the guys of this blog for putting out fantastic English subtitles – streaming or, if you are lucky, on some old dvd version. They are really worth your time. The later films were mostly realised for commercial reasons, Villaggio himself admitting candidly that sometimes “he went for a quick cash grab, just because he could, and it was fun to have so much money to spend”. So why should you watch them? I tried to make an essential list of reasons for an international audience to get more familiar with the characters and his work. 1 – it describes Italy and the Italians maybe like no other. Neorealism is famous for portraying real life situations, but what Fantozzi did in a unique way was to create a twisted, surreal and yet credible version of the reality in which people lived, populated with situations and characters that were immediately recognizable and connected very strongly with the audience. The stories are a concentrate of contemporary archetypes. We were saying, he deals with things of everyday life, even language – in Italy nobody, nobody can use the conjunctive right – and in all these situations he is a faithful representation of the average Italian: “average” in the truest sense, not as a negative. Lower middle class, white-collar almost meaningless job, rented flat, modest car. Fantozzi is a chronic loser, powerless against the twists of fate. In a way, his answer to the Hamletic doubt is: “I am, but it’s not enough”. Filini (Gigi Reder, left) and Calboni (Giuseppe Anatrelli, right) are two of the most memorable colleagues in Fantozzi’s office. He is not a hero, nor a modern anti-hero, he is just going through life, suffering one defeat after another as if there was no alternative. They did ridicule me, but if they think I am done with, they are wrong. Because I, Pina, have one characteristic. They don’t know about it. I am indestructible! And you know why? He brought to the scene the paradoxes and contradictions of everyday reality – and the form of a comedy helped to deliver it home. Audiences were electrified, it was liberating, and at the same time thought provoking. Fantozzi and his colleague-almost-friend, Geometra Filini. 2 – he changed the Italian language so much, he became part of the dictionary. The adjective Fantozziano is in every Italian dictionary and it roughly translates as “unlucky, awkward, tragicomical”. 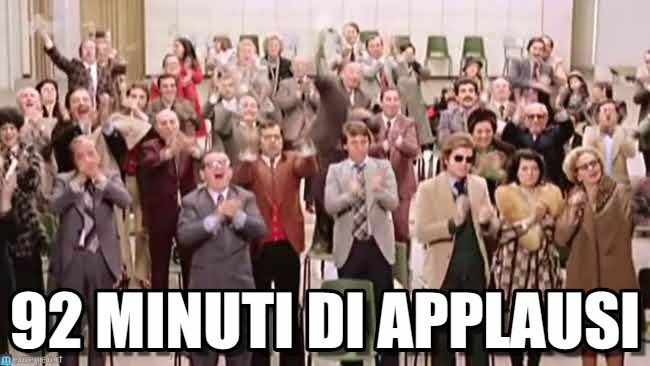 Every Italian uses the term when involved in such a situation because deep inside, we know that we are all Fantozzi. In his books (and later in the movies) Villaggio used only Italian, which was a challenging choice – many comedians preferred and still prefer regional dialects, which have a stronger comic potential – and adopted innovative solutions, creating expressions such as “merdaccia” (dipshit), “nuvola da impiegato” (the white-collar rain cloud), “Megadirettore Galattico” (Galactic Megaexecutive), and “92 minuti di applausi” (92-minutes standing ovation) that are until now part of the everyday Italian language. “Capovaro, vado?” is another memorable scene. His characters make lots of mistakes (especially in the dreadful congiuntivo and the formal register), but they still insist in speaking Italian. They fail, but they keep trying. In Italy, dialects are still often used when people want to make sure to understand each other, but Fantozzi and his colleagues never resort to them: it’s their attempt to show that they belong to the modern, industrial society. This symbolizes perfectly how everything – even language – can be used as a tool of oppression, of class struggle, used against people in their everyday life. Seriously, you can understand some shades of Italy only if you know Fantozzi. And that’s why so many of us know it by heart. Signorina Silvani (Anna Mazzamauro) is the Ragioniere’s forbidden office romance. 3 – it was probably the first “office dramedy”, creating a new genre. It’s hard to draw a precise line, but its innovative storytelling aspects and the situations portrayed surely inspired a fresh way to describe situations that were happening in a brand new social setting: the office. For the Italian cinema, “Fantozzi” was a unique case: far from the classics and the tropes of the time, almost no linear plot, episodes based exclusively on grotesque and caricature, innovative and brave use of the language. Nevertheless, the world created by Villaggio & co was real, alive and pulsating with life. A miserable (and very human indeed) life. It’s hard not to see how the paradoxical way in which Villaggio described the everyday life of a bunch of co-workers have anticipated – or openly influenced? we will never know – the later production on the same topic, from Sluzhebnyy Roman (Office Romance, Russia, 1977) to the most contemporary The Office (2005). And… The Simpsons (1989), too. Can this be a coincidence? Fantozzi and the Mega Direttore Galattico, at the memorable sequence at the end of the first movie. Homer Simpson and Mr Burns. Coincidence? 4 – he is a modern clown who became a contemporary myth figure. Make no mistake: as a character, Fantozzi is a clown. His comedy is first of all physical, Villaggio is a master of using his body and facial expressions to deliver emotions and messages, and he uses frequent and exaggerated slapstick. He gets sad, angry and (more rarely) happy, but the feelings are always brought to the extremes. Critics have found references to Buster Keaton, Chaplin, the characters of Gogol and Kafka, and surely Villaggio has anticipated Rowan Atkinson’s work for “Mr Bean”. “Che fai, mangia?” The legendary sequence at the dieting clinic, from “Fantozzi contro tutti”. Watch the full sequence here. It is really memorable. Fantozzi is brought to us for the only purpose to evoke a strong emotional response. Laughter, and sometimes sadness. Laughs are almost always bitter, in his stories. There is an aftertaste of human misery, desperation and intimate loneliness that runs through all of his adventures. The audience watches them and the impersonation is so complete, people realize “this is actually us”. Then the smiles tend to fade away. In his struggle, Fantozzi is completely alone. His allies are in some cases occasional companions in his misfortune, but never really “friends”: even his ever-loyal wife will at most concede that she “esteems him”, as romantic love is definitely out of reach for those who fail in life. Pina (left, Liu Bosisio) and Mariangela (right, actually played by a man: Plinio Fernando) complete the Fantozzi Family. Later defined “the synthesis of disgrace, the apotheosis of ugliness“. Fantozzi fights against things that are way bigger than him. Life, fate, class struggle: no matter how hard he tries to overcome them, in the end they will swallow and assimilate him. At the same time, Fantozzi doesn’t have enemies either: the upper class is composed by industrialists, aristocrats and usually both (with their hyper-long names and titles that evoke fear and awe, like Duca Conte Piercarlo Ingegner Semenzara and Professor Guidobaldo Maria Riccardelli: an everlasting finger in the eye of the arrogance of aristocratic and academic environments). These modern gods are so distant, their lives happening light years away, only occasionally intertwining with those of the “subordinates”. And when it happens, it rarely ends well for the common mortals. Like in this memorable sequence, one of the few available on the Tube with English subtitles. This is probably how Fantozzi manages to become a (very atypical) hero figure. His suffering is our suffering, his exaggerated misfortunes are also our daily tribulations in life. His challenges are so great, he will never overcome them – a man cannot beat his destiny, seems to be the morale of his story – but this somehow makes us feel less desperate, less lonely. The catharsis takes place not in his final victory, but somehow in his defeat. 5 – it’s fiercely, intensely political – and not in the nice way. Villaggio was openly a leftist. His analysis of the class struggle and the social tensions of 70s was brutal, very far from the complacent view of some political and literary salons. On the contrary, he strongly criticized the Left for effectively betraying the working class by becoming a bureaucratic, intellectual and self referential structure. The fact is represented in a memorable sequence centered around a parody of “Battleship Potemkin“, Soviet propaganda movie that workers are forced to watched time after time against their will. Villaggio’s contempt (disguised behind a smirking mask) was open, and sparked an intellectual and political debate that lasts until our days. Some critics say that Villaggio, by ridiculing the “high culture”, is actually responsible for alienating even more people from it. (My personal opinion – not that it matters – is that the jester’s only job is to shout out “the king is naked!”. What happens after, including whether the king is actually naked, is not of his business). Whatever the case, through his exaggerated and grotesque events, workplace, family and society are dissected, represented as feudal micro struggles, a dog-eat-dog universe in which there can be no success, no salvation. And no idealism – therefore, no ideology. Religion is only there as part of the background, just another towering structure; and politics are irrelevant. The world of Fantozzi shows no sign of mercy or class solidarity – workers are together, but never “united”, ready to turn coat in sight of the slightest opportunity of personal gain. And once again, he was bringing this to the scenes in the middle of the 70s: extremely turbulent political times. Watching these stories today, when the excesses of capitalism are showing their true face, makes “Fantozzi” appear as a prophetic warning from the past. One we clearly didn’t listen. For Villaggio there was no hope: faced with challenges, everybody did their worst. People were maybe forced to live together, but to die alone. So be prepared, if you watch the films: these are not at all “easy slapstick popcorn comedies”. You will laugh, but in the end you will left wondering if the tears in your eyes are not something else entirely. They do deliver a nasty punch. Thank you very much for reading this far – or just for scrolling down and browsing the pictures! This was my very personal homage to Paolo Villaggio and his characters. I owe much to the man (and probably even more to the character), and I will forever remember his work and ideas. I hope with this some other will have a better understanding of who he was. The Ragioniere is hired as a personal lucky charm by the all powerful Duca Conte Semenzara, an avid casino gambler. From “Il secondo tragico Fantozzi“. If you like the post, share it with friends, colleagues and everybody who at least once has been considered a merdaccia. Feel free to post in the comments below what is your personal connection with Fantozzi and his movies, and what is their relevance for you. And if you want, you can also follow the facebook page of the blog, right here. Thank you, Paolo. And goodbye. I think that the characters is well represent by the scene of minestrone. Moreover this one is probably one of the most bitter in the whole italian cinema history, when someone watch this doesn’t know how to react and also if you laugh you can’t do that without some tears ready to drop. However, Carmine thanks a lot for this post and this collection of videos, it is always a pleasure to saw them once again. Yes, I think what is unique about Villaggio’s humor is that there is always a bittersweet taste. That really makes it stand out. What is the “minestrone” scene? That depiction is pretty close to the russia too. Next“Dunkirk”: a personal, gripping war story that is NOT a war movie.